This weekend Felkerino and I headed into Pennsylvania to check out some roads for the upcoming D.C. Randonneurs 400K that we agreed to organize. It was a gorgeous day on the bike and I’m glad to have ridden farther out than my usual D.C. to Poolesville, Maryland loop. Our route took us from Emmitsburg, Maryland, into Adams County, the Michaux State Forest, a brief passing through Caledonia State Park, and up to Newville, Pennsylvania. 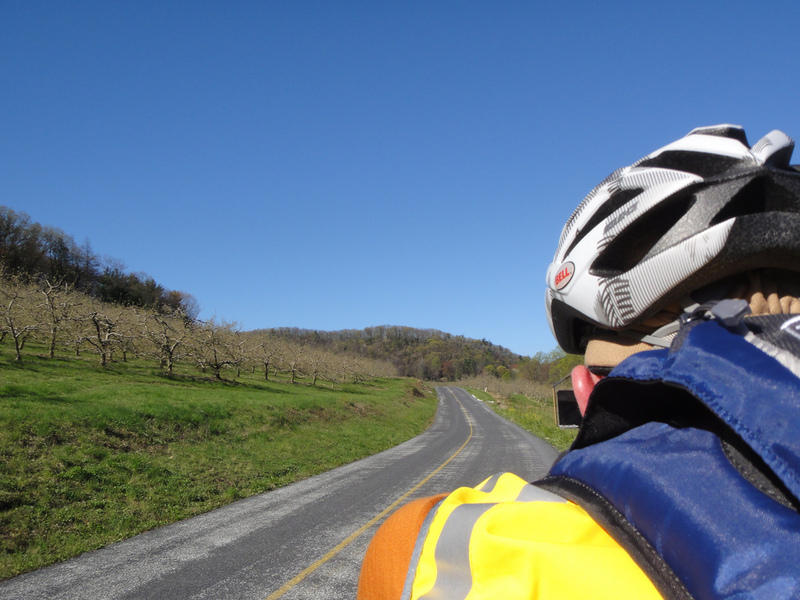 We then rode back through the Michaux State Forest into Pine Grove Furnace, climbed out of Pine Grove Furnace and reversed through the orchards to our starting point in Maryland. Saturday was a gorgeous day to be a bike rider. While windy, the sun was toasty pleasant, and our route kept us sheltered from much of the direct headwind. The return trip? Tailwind tailwind tailwind. Having traversed many of these roads only on the 400K, it was a nice change to do them on a normal century ride. My legs were fresher, and I wasn’t watching the sun go down. Our ride also toured a bit through torture orchard country. 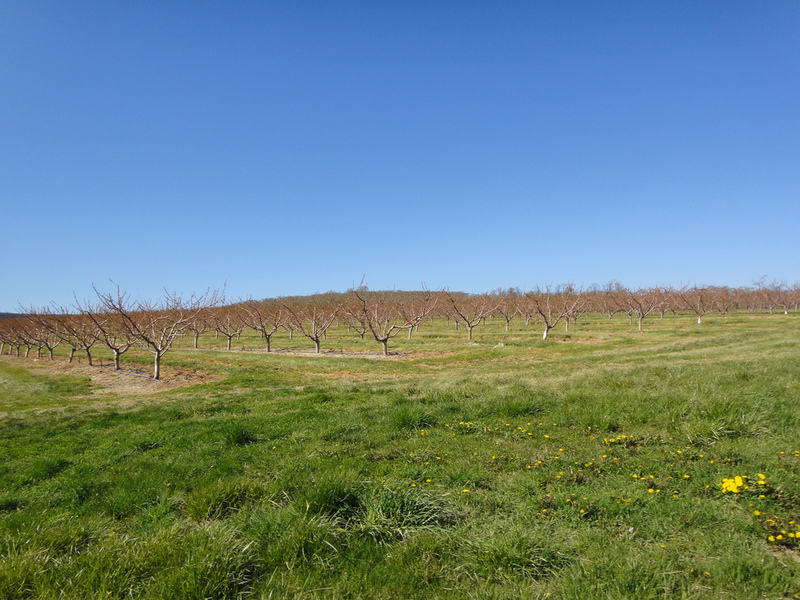 The rows of fruit trees and early blooms popping out on the branches against the backdrop of big hills and greenery were quite picturesque, and they helped ease the pain of the grinding terrain. A last shot of orchard country before my camera bit the dust. The toughest climb of the day had to be the climb up 233 to Shippensburg Road. While most of it is a manageable grade, I totally forgot about the one pitch where Felkerino and I have to stand in the granny for an interminable amount of time while I wonder at each pedal stroke whether I have another one in me. I won’t forget that rise when we’re back doing the full checkout ride. Felkerino and I have organized a ride in the past, the well-known Warrenton (aka Old Rag) 200K. Organizing a 200K is much easier, as it takes place over 13.5 hours, starts later in the day, and riders don’t travel as far. A longer event, like the 400K, is more intimidating because: the event starts much earlier and ends many hours later than a 200K event; people have up to 27 hours to complete the course; places to fuel throughout the route become much greater considerations; and rider fatigue becomes more of a factor. 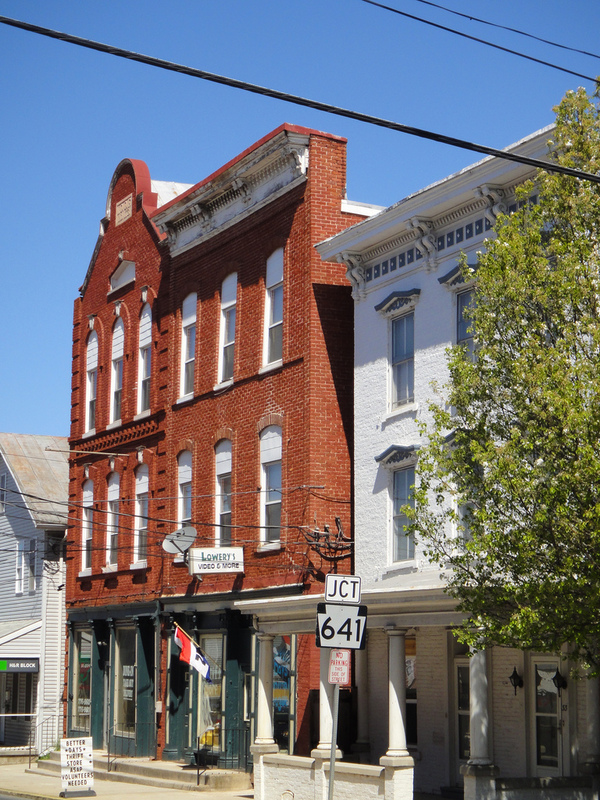 In previous years, our 400K route passed through a sub shop in Newville, Pennsylvania. However, that business closed and we were out scouting alternate options so that riders can still control in that same general area and our route can be preserved. I’m happy we’re taking on this new challenge of organizing the 400K, as it provides a different lens on brevets. Sort of a “behind the scenes” perspective. One of the first things I’ve noticed is that, the challenges of our economic times are much more noticeable in smaller towns. Communities that once had a gas station and a restaurant now have no restaurant and maybe a gas station that operates fewer hours per week than in the past. Places we could once count on as a control are no longer a going concern. The dilemma ride organizers face is how to effectively navigate sticky wickets like these and still pull off a great route. Do we run a staffed control and, if so, where? Do we stick with the same route and go without any services for a long stretch? Do we re-route to a larger community that might have more traffic yet offers more services? Going through all this forethought makes me appreciate the work that the D.C. Randonneurs organizers and volunteers have done to make our rides beautiful and successful. And Felkerino and I are not even coming up with a new route; we’re just re-routing a small segment of it. Route design is truly an art! I think our club prides itself on good courses that cross lightly traveled roads, and well-spaced controls that meet riders’ needs (food, restrooms, and a place to regroup if needed). As we plan and prepare for our 400K out of Frederick on May 26, Felkerino and I will keep all of those points in mind so that everyone can have a great ride. Looking forward to the big ride. SR here I come!! Nice set of pix. I really need to get Big Nellie out in the countryside. Maybe Saturday…. Thanks for taking this on. I feel tired already. An interesting perspective. I imagine there’s a little bit of pressure, knowing that if there is a missed detail things may literally go off course. I like the change in perspective, but definitely makes me want to make sure everything is thought out.